Post your property on Skipjump in a snap. 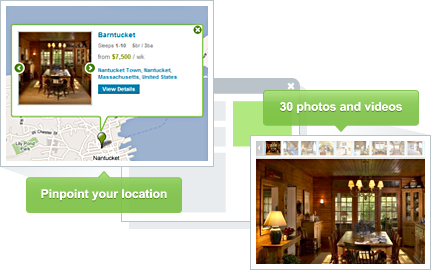 Combine photos, video and maps to drive more inquiries and close bookings. Free. Skipjump offers a superior advertising and distribution solution for rental property owners and managers. 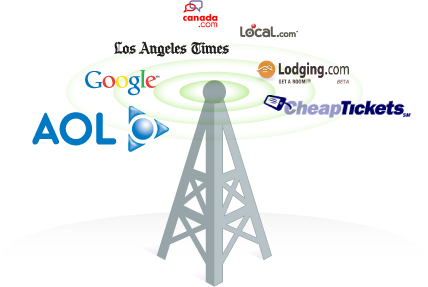 Skipjump's extended distribution network puts your property on recognized travel brands, including popular destinations like AOL Travel, Lodging.com, Lycos.com, Local.com, Military.com, Away.com, LA Times Travel, London Sun, and Cheaptickets. Using real-time property feeds, our listings are also syndicated across the web to other popular online channels: including Google, Twitter, and Facebook. RSS feeds and Skipjump's property widget allow syndication anytime, anywhere. Through our extended distribution network, Skipjump property listings receive more than 100,000 views a month. Our listings are displayed across multiple online channels outside of Skipjump.com, maximizing visibility to your rental property. 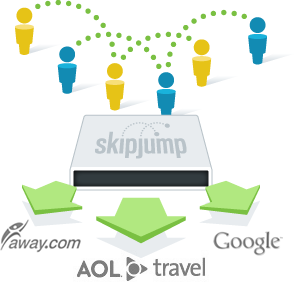 Skipjump listings reach tens of thousands of travelers monthly through organic search results listings on major search engines including Google, Yahoo, and Bing. Monthly visitors continue to double month-over-month*, making us the fastest growing vacation rental accommodations destination online. Showcase your property by combining videos, photos, and maps on a single Skipjump page. Organize and display up to 30 photos and videos quickly and easily: upload photos from your computer, and import videos from popular sites like Vimeo and Youtube. Pinpoint your location for renters by putting your your property on an interactive, searchable map. Skipjump's features are designed to merchandise your property, maximizing traffic, inquiries, and bookings. Define your own date ranges for peak, off-peak, holiday or other rental periods. Set rates by day, week, month, or weekend. Our flexible rate cards put you in control. Set blackout dates to show when properties are booked. 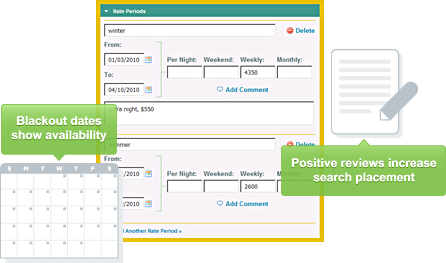 Easily convert inquiries to bookings, and set blackout dates with a single mouse click. Good feedback leads to more exposure: invite renters to vote, rate, and review your property, and you'll increase your ranking in Skipjump search results. Our inquiry system blocks spammers and bots, so you get qualified leads, from live human beings. Skipjump inquiries arrive in your email inbox: there's no need to re-visit the site. Just hit "reply", and you've started a direct conversation with your potential renter. 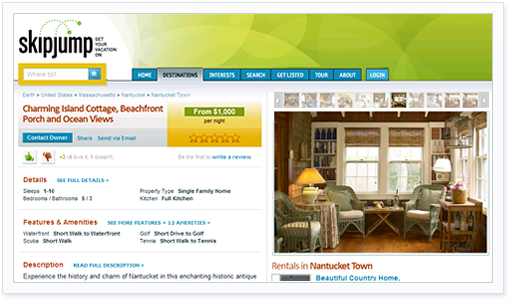 You can also add a phone number and website link to any listing page for additional customer touch-points. 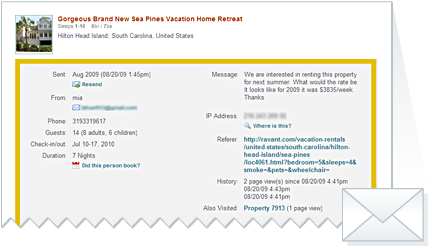 Detailed inquiry reports display where in the world renters are contacting you from, and shows you other properties they've viewed prior to sending you an inquiry. The Skipjump platform is a full-featured property merchandising tool: detailed descriptions; kitchen, bed, and bath accommodations; amenities listings; keyword tagging; voting; and special interest categories like skiing, golf, beachfront, scuba, and tennis. Built by pros, for pros. 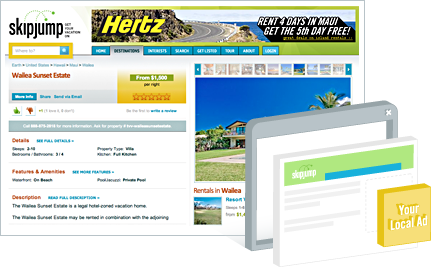 We built Skipjump from the ground up to be a powerful, streamlined rental advertising platform. Then, we made it free. Get started with Skipjump! You'll be posting your properties in minutes. Put your company's message in front of a global market travelers visiting your location. 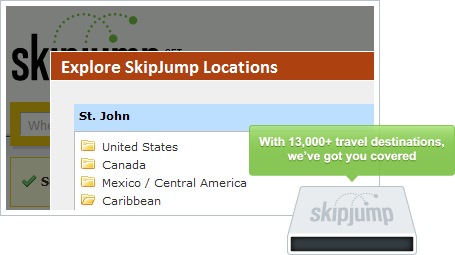 Skipjump's hyperlocal targeting capabilities deliver a tailored campaign across over 13,000 desintations. Automate publishing and keep property updates in sync across the web. Our distribution network service maximizes visibility on high-traffic travel websites like AOL Travel, Cheaptickets, Lodging.com, and more. Skipjump, and the Skipjump logo are registered trademarks of Skipjump, LLC. All other logos and marks are property of their respective owners.